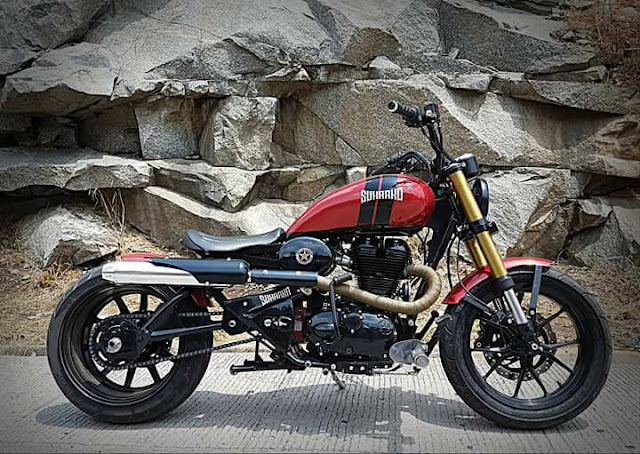 Sukarno is the custom bike built for Kannada Actor Rakshit Shetty by Bulleteer Customs. The stock bike used Royal Enfield Thunderbird 500. On the modification, the front forks goes upside down with golden finish. Custom Swing arm came up. Custom fenders are placed. Instrument Console. Handcrafted fuel tank with red paint and black strips and single bobber seat. Side Panels with Bulleteer customs logo, custom exhaust is fitted, both alloy wheel with meatier rubbers are used. Rear tyre got disc brake and petal disc at front. Overall this bike takes our heart towards it.